We are proud to host our 2nd Day of Zwanze at the brewery on September 23rd! Tickets: In addition to festival tickets, this year designated driver tickets will also be available. A break down of what each ticket included is listed below. $100 Day of Zwanze Ticket - Tickets are non refundable. There will be a limit 4 per purchase. 500 tickets will be available. Tickets include a sampling glass and 20 drink tokens. Tickets do not guarantee a pour of Cantillon Zwanze. Cantillon Zwanze will begin pouring at 2:45 pm and will be first come first serve for the Zwanze toast at 3 PM. $30 Designated Driver Ticket - These tickets have a strict no drinking policy. Limit 1 per purchase and these are also non refundable. Ticket includes 1 food voucher. Hamajang: A blend of two sour ales, Sea Buckthorn Fandango and Innovator Man. Innovator Man: Sour fruit ale brewed with Sea Buckthorn. Sea Buckthorn Fandango: Sour fruit ale with Strawberries added, brewed with Michigan Cascade and Chinook hops. Turbo Bam: Rye farmhouse ale brewed with Coriander, Lemon Peel, and Szechuan Peppercorns. Coolship Resurgam: Cooled overnight using outside air temperature in a large shallow pan known as a coolship. Aromas of apricot, lemon zest, and candied fruit. Notes of tropical fruit and flavors of funk lead to a clean, tart and dry finish. Time Waits for No One: Imperial Stout aged in Portuguese Port barrels. Brand New Eyes: A Red wine solera farmhouse with Motueka hops. Graffiti Heart: A blended red sour Foeder and select barrel blend, brewed in the flander-ish style. Peacemaker: A blend of two spontaneous solera fermented beers aged in cherry wine barrels. Cloudmaster: Spontaneous American wild ale. Dreamland: Spontaneous sour golden ale. Armand & Gaston: A blend of 1, 2 and 3-year Lambic. Hommage: Lambic with raspberries and cherries. Oude Kriek: Lambic with cherries. Booger Hill: Uses local honey from Booger Hill Bee Company in Danielsville, GA. Rested 12 months in French oak. Ticky Tick Buzz: Kvass de Miel. Brewed with multigrain bread, cardamom, and honey. Tiki Tack: 100% Brettanomyces Gose with Guava and Passion Fruit. A collaboration with Brewski. Sauvage Miel: 100% Brettanomyces Farmhouse Ale in which 30% of the fermentable sugars are FL grown Orange Blossom Honey. Hopped entirely with Mandarina Bavaria. Squared: Blend of 1, 2 and 3-year Lambic. Quetsch: Blend of 1 and 2-year Lambic with plums. Witchfinder: A sour Brett Saison. Choir of the Sun: Mixed culture Saison fermented and aged in oak puncheons. Sudachi Table: Mixed fermentation beer aged in oak on Sudachi fruit. Phosphene: Ale aged in oak barrels on apricots. Elle: Mixed fermentation Saison aged in an oak foudre. Scrip: Grisette Style Ale aged in wine barrels. Hockhocking: Mixed fermentation Saison Style Ale aged in wine barrels. Spon Methode Gueuze: Blend of 1, 2, and 3 year old Spontaneous beer. Le Petit Prince: Farmhouse table beer. Omniscience and Proselytism: Mature barrel aged beer re-fermented on Texas strawberries. Provenance Lemon and Lime: Farmhouse ale brewed with Texas lemons and limes. Veritas 19: Oak Aged Sour Ale with Raspberries. Apocolocynposis: Barrel aged farmhouse ale with blackberries and lime made in collaboration with Jolly Pumpkin Artisan Ales. Amigas y Amigos: Wild blonde ale aged in an oak barrel (single-barrel) for two years. Anniversary Ale: Brewed with Michigan grown & malted barley, wheat & rye as well as Michigan grown Cascade, Chinook & Copper hops. This toasty, nutty ale is full of caramel notes. Yuzu Fierce: Berliner weiss and saison hybrid with yuzu. Cream of Broccoli: Imperial IPA with Cascade, Hallertau Blanc, Mosaic, and Simcoe, oats, and lactose sugar. Double Dry-Hopped Southernhopalistic: Double dry-hopped India Pale Ale with Nelson Sauvin, Motueka, and Topaz hops. Double Dry-Hopped Double Mosaic Dream: Single hop Mosaic Imperial India Pale Ale. BAFPA: BAFPA is produced by blending varying vintages of our flagship farmhouse ale that have been resting in French and American oak barrels. Wild 10: Wild red ale aged in wine and bourbon barrels. Wild 22: Oak fermented brett saison aged on peaches. Funky Wit Raspberry: Mixed fermentation Belgian-style Witbier aged in oak with Raspberries. Funky Wit Charentais Melon: Mixed fermentation Belgian-style Witbier aged in oak with Charentais Melon. Funky Wit: Mixed fermentation Belgian-style Witbier aged in oak. Eden’s Lot: blond ale in French oak for 6 months and refermented on passion fruit and guava in stainless steel for 2 months. Bottle conditioned with brettanomyces. Flowers of Tokushima: 8 month Foeder aged American Farmhouse beer. Sudachi Lime juice and yuzu zest added and bottle conditioned. West Ashley: Saison aged in French Oak Pinot Noir barrels with apricots. Capitola Sunset: Saison inspired by the pink, orange, and azure sunsets right outside the brewery door. Chanterelle Biére de Garde: Made with foraged chanterelle mushrooms from the woods surrounding our brewery. Strawberry Rhubarb Sour: Sour beer made without hops, made with local strawberries and rhubarb, boiled over a direct-fire in our copper kettle and fermented with our wild house mixed culture. La Ruche: Saison Aged in Missouri Oak with Orange Blossom Honey. Spontanfermier: Barrel-fermented Missouri spelt Saison blended with Belgian Lambic and brewed in collaboration with our friends at Mikkeller. Hyper Paradise: golden sour beer aged in oak barrels with mangoes and passion fruit. Seditious Ways: dark sour beer aged in oak barrels with tart cherries. Shades of Cool: golden sour beer aged in oak barrels with black currants. Another World: blended red sour beer aged in oak barrels. Hop Hands: American Pale Ale with Oats. Saison Hands: A hoppy Saison. Ourison: An oak aged Saison. IREALLYdontwanttoBU: Double dry-hopped 0 IBU IPA with Citra and Mosaic. We Ded Mon: Triple IPA with 100% Citra hops. Saison de Bois: Mixed culture Saison aged in 20 year old French Oak Puncheons. Cherry Deux Rouges: Flanders Red ale aged in freshly emptied Merlot barrels for 20 months and conditioned on Cherries. Zure Bruine: Flanders Brown ale aged in red wine barrels for 2 years. Food will be available for purchase during the festival. Vegetarian and vegan options will also be available. Day of Zwanze at Jolly Pumpkin is hosted by The Dexter Area Historical Society. The Dexter Area Historical Society (DAHS) is a nonprofit organization in Dexter, Michigan, which supports the preservation of the history of the Dexter area. All profits from the Day of Zwanze ticket sales will go directly to the Dexter Area Historical Society. “My youngest son, Sylvain, will be 18 come October. As we did for his older brother, Florian, I wanted to celebrate this milestone by dedicating a beer to him. And what better beer than the Zwanze. I wanted to involve Sylvain in choosing the beer, and when I asked him what blend we could make. He told me: “ I love iced tea, could we try a blend with tea?”. After a superb tasting of several different types of tea at “Nong Cha” tea shop in the center of Brussels, we chose three teas for trial blends with Lambics. After a few days of maturation with 2 years old Lambic, we decided on a “Oolong” (Wulong), a semi-fermented blue-green tea. The Lambic-tea blend gave a great result. The beer was delicate and round, with notes of fruit and slight bitterness. 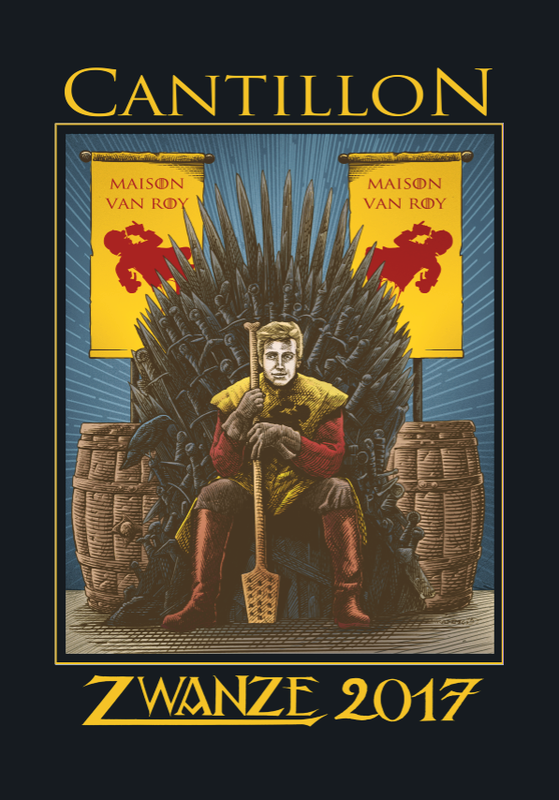 Sylvain is a huge fan of “Game of the Thrones” which inspired the graphics for the 2017 edition of our Zwanze. But in our version, no one dies and everyone has a good beer! 1. Everyone must be 21+ to attend. Yes, even designated drivers. This is a beer festival, no minors. 2. Tickets are non-refundable and non-transferable. 3. You must have a valid ID to enter. 5. Jolly Pumpkin Day of Zwanze merchandise will be available for purchase during the event. 6. Null Taphouse will be open from noon until 11 pm during Day of Zwanze. 7. Parking will be available onsite as well as at neighboring businesses which will be marked. 8. No alcohol will be allowed in our parking lots before, during, or after the event. 9. All beer samples are 4 oz. 10. Pours of Cantillon Zwanze will be 4 oz and will be first come, first serve. We will begin pouring Zwanze at 2:45 PM, the gates open at 2:12 PM. When it is gone, it's gone. Choose wisely. 11. Day of Zwanze will go on rain or shine. Don't worry we have a big tent. 12. Last call will be at 6:30 PM. Older Post: RETURN OF A CLASSIC AND THE CONTINUATION OF A COLLABORATION SERIES!